The new Fotodiox Pro High-Intensity LED Light is designed for the studio photographer yet ideal for all situations! This professional lighting system has a high light output that rivals most lights today. LED light technology allows for plenty of lighting power, while the housing itself remains cool to the touch. Unlike other studio lights, the Fotodiox LED100WA series give off practically zero heat, allowing for more comfortable and longer sessions for both the subject and the photographer. The high powered LED100WA is available in either 5600 Daylight or 3200 Tungsten color temperatures, and has a remarkably low electrical draw for such a powerful light. Lower your energy bills, keep your studio cool, and run these powerful lights on a regular domestic electrical circuit. The LED lamps themselves have a high color rendering index (CRI >85); providing clear, color correct light that will faithfully render the subject's color. The LED's built-in glass diffuser creates a soft, even light. Reliable LED lights don't require replacement, making the Fotodiox LED100 much reliable than strobes or other constant source hot lights. 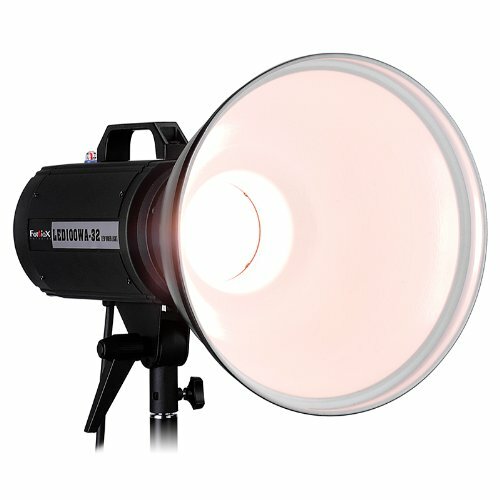 The LED100WA light is equipped with the popular Bowens bayonet mount for light modifiers and other accessories such as soft boxes, umbrellas, barn doors, snoots, and more. The versatility and cool-to-the-touch operation of the LED100 make this light a powerful and economical solution for both the hobbyist and the serious photographer and videographer.